NLP: Going Meta – Advanced Modeling Using Meta-Levels (1997-2000) – The field of NLP began as an adventure in modeling experts. The originators asked, “How do the experts communicate, relate, and map the world?” When they then modeled three therapeutic wizards, the adventure began. As an expression of the Cognitive Psychology movement in the last half of the 20th century, NLP began as an exploration into the very structure of experience. 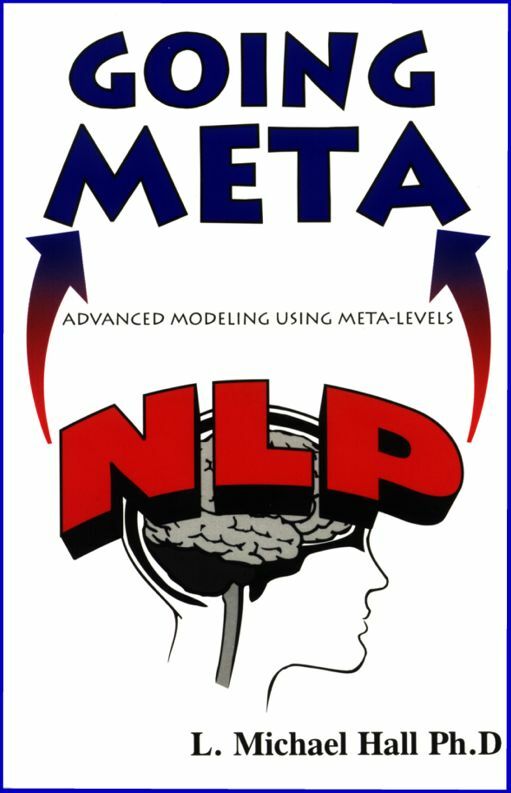 NLP: Going Meta offers the next step in modeling. This work provides a crucial piece to the NLP Model, the mechanism and magic that comes from the reflexivity of human consciousness. Here you will discover how the higher levels of mind (the “logical levels”) play a role in modeling the structure of experience. In this book, Dr. Hall invites you to transcend the primary states of mere representational steps and rise up to a meta-level of awareness to map out the higher and more complex frames of mind, the meta-states. Here you will learn how to factor these higher levels in. In NLP: Going Meta you will explore the genius of Korzybski, Bateson, and Dilts on the idea of levels and frames that serves as the foundation of Meta-States and Neuro-Semantics. This is a book about modeling. It is about standing in awe of the expertise that certain persons demonstrate and setting out to find the structure of how they do what they do so magically. The passion that drives modeling is the curiosity to understand and replicate excellence. And it is that passion that has inspired this book. This book is also about extending and expanding NLP modeling. Conceptually it picks up where the first academic book in the field of NLP left off. The original developers of NLP (i.e., Richard Bandler, John Grinder, Leslie Cameron-Bandler, and Judith DeLozier) commissioned Robert Dilts (1980) to write Neuro-Linguistic Programming: The Study of the Structure of Subjectivity, Volume I. This work shows how Meta-States takes the NLP Strategies Model and addresses more extensive and broader issues in the adventure of modeling. In that, it presents a different kind of modeling. Denis Bridoux brought this to my attention in the fall of 1998, when he and Dr. Phillip Nolan invited me to present The Merging of the Models: NLP & General Semantics as a workshop in London. As we worked through some of the Mapping/Engineering processes in Science and Sanity (1933/1994), Denis noted that the Korzybskian structures offer “modeling with a different twist.” That realization renewed my interest in the design engineering that Korzybski worked on and the kind of modeling that emerged from his work. Over the years I repeated that training and expanded my research in modeling to include mathematical models for modeling, sociological models, Game Theory, Fuzzy Logic, etc. Here I have followed the work of Woodsmall’s following distinctions between different kinds and levels of modeling. Wyatt has designated these as Modeling I and Modeling II. Modeling I: Pattern detection and transference. This kind of modeling detects a pattern of behavior that results in certain skills, abilities, and expertise. It explicate the patterns of behavior in the skills–the what that an expert actually does to achieve a result. This kind of model presents us sets of distinctions, procedures, and processes which enables a person to reach a desired outcome. Modeling II: Modeling Modeling I. This focuses on the how of an expert. How does the expert actually perform what he or she does. In this kind of modeling, we focus on the processes necessary to generate the patterns that form the what of Modeling I. Here we especially pay attention to the beliefs and values that establish the frames which govern the expert and his or her modeling. These include the meta-programs frames, the meta-states, contextual states, etc. The field of NLP appeared as the result of Modeling I. It emerged from the joint venture between Dr. John Grinder and Richard Bandler as they began studying the language patterns of Fritz Perls and Virginia Satir. Richard had the genius of mimicking and copying both Perls’ and Satir’s speech, tonal, and language patterns while John’s genius involved his skills in Transformational Grammar to pull apart the structures in terms of language. As a result, they eventually identified what the therapeutic wizards did that had such a “magical” effect upon their clients. From that adventure in modeling, they published The Structure of Magic (1975/ 1976). This introduced the first NLP Model itself and one of the central technologies of NLP for modeling–the Meta-Model. This linguistic model, as one of three meta-domains, puts into our hands a crucial tool for modeling the structure of a person’s reality. The Meta-Model allows us to peek into a person’s Model of the World and to begin to more fully understand how a given person constructs a particular subjective experience. NLP did not start with Modeling II. Even to this day, we have no model of how Fritz, Virginia, or Milton thought, felt, believed, etc. That level of modeling did not begin until some time later. As Bandler and Grinder wondered about the modeling itself, they began to explore the modeling processes, assumptions, patterns, etc. That’s what led to write NLP: Volume I. What strategy did Perls use in working with clients? What strategy enabled Satir to do her “magic” with families? What strategy describes Erickson’s calibration skills and use of hypnotic language patterns? How did any one of those wizards make decisions about what to use when? Representational system language, the VAK or the 4_tuple. Language accessing cues or linguistic markers. Neurological accessing cues (eyes, body, gestures, and breathing cues). Anchoring, pacing and leading, the NLP-enriched T.O.T.E. model, etc. Over the years, other pieces of the NLP model arose: Belief Change Patterns, Value Elicitation and Change, Meta-Programs, States, Frames and Reframing, Logical Levels, Meta-States, etc. Using the initial model of modeling–the Strategies Model, numerous developers, theorists, and practitioners of NLP began learning the skills of Modeling II. As they did, they went forth to model. They did this by finding experts in various fields and using the NLP distinctions about the structure of subjective experiences. This enabled them to detect, elicit, unpack, design and redesign, install, and utilize models of excellence and expertise. Out of that arose more and more specific patterns about various aspects of human experience. These include models for healthy eating, losing weight, maintaining weight, staying fit, communicating, relating, confronting, asserting, parenting, managing, creativity, shooting, skiing, diving, curing allergies, curing phobias, ending old traumas, etc. The list goes on and on. Much of that complexity is a result from the way the expert layers levels upon levels of thoughts, emotions, and concepts to create the rich mind. It is this rich textured consciousness that we can now unpack with the meta-levels of Meta-States. I happened upon the Meta-States Model while engaged in a modeling process in 1994 (Hall, 1995, 1996, 2000). After studying what other authors and theorists had written about resilience, I set out to interview several individuals considered highly resilient individuals. These people seemed to have an expertise in bouncing back from setbacks. While many things could knock them down–nothing seemed to keep them down. They would not quit. They were unstoppable. They continually got up, dusted themselves off, and “went for it” again. Even more, though these individuals had experienced traumatic events (rapes, war, robbery, abuse, etc.) They had not been traumatized. I wanted to know their strategies. What prevented them from getting knocked down for good? What enabled them to get right back up? How were they able to make intelligent learnings from the difficult and painful experience? How were they able to maintain a positive, appreciative, and dignified attitude in the midst of setbacks, and defeats? What enabled them not to become trauamatized when “bad” things happened to them? Using everything I knew about strategy work, I set about to decompose the neuro-linguistic processes involved in the strategy of resilience. Yet upon obtaining numerous elicitations, I found that I could not diagram the process in a linear and horizontal way. I discovered that I had to keep looping back, and up, that I had to continually move up to meta-levels to take into account the supporting beliefs and values, the criteria that governed their decision-making, the empowering higher level decisions, the domains of understanding, the frames-of-references that they used and the frames-of-those-frames. When all was said and done, I was able to begin articulating a Model about Meta-Levels to structure and engineer “the second-order abstractions,” “third-order abstractions,” etc. of Korzybski. This gave birth to the Meta-States Model (Hall, 1995, 1996). In one sense, this complicated the modeling process even more. It asks a modeler to take into account the higher level structures and the ordering of thoughts- about- thoughts, feelings-about-feelings, and numerous principles in systems thinking. Yet in another sense, it simplified the modeling process as it provided a way to tease out the levels and to recognize what as happening to the neuro-linguistic system. Later, I discovered similar models in various facets of Cognitive Psychology that had simultaneously emerged, for example, the field of Meta-Cognition (1977). This means that the patterning which occurs at the primary level of experience operates within (or we may say, is embedded within) higher patterning structures. This represents both an old theme in NLP and a new development. It refers to something old in NLP, something that we have has had around–higher levels (beliefs, values, Dilts’ Neuro-Logical levels, Gordon’s belief array, etc.). Yet simultaneously it refers to a brand new development in that it provides a more extensive and flexible way to conceptualize and think about meta-levels. I have devoted an entire chapter to the extensive work of Robert Dilts in his development of numerous logical level systems. That chapter highlights his insightful developments, especially his model of Neuro-Logical Levels. Yet because that model represent a static hierarchy of levels, it lacks the flexibility to take into account the non-linearality and fluidity of meta-cognition. The meta-levels of the mind are not static, rigid, or in a hierarchy. They are fluid, plastic, and function as a holography. From the beginning of NLP, the co-founders of this domain alluded to logical levels. NLP especially depended upon Bateson’s logical Levels of Learning (1980: 158_160, 212). In this work I have returned to Bateson’s research to both highlight and mine more of his treasures regarding meta-levels. I have also devoted much attention to another grandfather of neuro-linguistic training (the person who actually coined that term), Alfred Korzybski. Korzybski provided the original model for how our neuro-linguistics (our mind-body abstracting or modeling processes) take in “information” via our sense receptors from the territory out there to create our neurological and linguistic maps of that territory. Along with Bateson and Korzybski, Robert Dilts (1983) has contributed so much to our understanding of meta-levels. He wrote the first extensive application of logical levels in NLP. The first seventy-eight pages of Roots (actually written in 1976) constitute the first NLP translation of Korzybski’s levels of abstraction as well as analysis of Gregory Bateson’s work. At the same time, the depth and complexity of that writing has also undoubtedly contributed to keeping it from becoming well known and integrated into NLP. Part of my design in this work is to make Robert’s original work more explicit. As NLP, a model of human functioning, has developed and grown in the nearly twenty-five years since its inception, numerous logical levels systems have appeared. I have identified and described a dozen of those models (chapter four). I have also included a list of other sets of levels that have been contributed to NLP, but which do not meet the criteria of being “logical levels.” As far as I know, the chapter on “logical levels” (Ch. 3) serves as the only written material (to date) that provide an extensive understanding of the criteria that comprises meta-levels. To understand the structure of a subjective experience we not only need to know the horizontal direction where one’s mind-body goes, we also need to know the vertical direction. The TOTE model of strategy analysis that examines a person’s representations, meta-programs, “submodalities,” etc. gives us the tools for the first set of distinctions. Finally, as I bring this book to completion, I have attempted also to integrate some of the modeling concerns that Dr. Martin Roberts in the UK brought to the whole issue of modeling in his articles in Rapport. Have we over-sold modeling when some have publicized NLP as giving the magic key to everybody? “Anything one person can do, anybody can do.” Roberts (1998, 1999) has surfaced the concern about NLP’s elimination of background knowledge. Martin has asked some hard questions. If we get a pilot’s strategy for flying, his VAK process and his beliefs and values, etc., does that give us enough to ask him to turn over the controls to us? Do we not also need to ask, “What do I absolutely have to know about these gauges before I take over?” And what about the training of the vestibular representational system that provides the pilot with a sense of balance? If you noticed the term “submodalities” in quotes, this highlights another facet of the NLP Model that the Meta-States model (Hall, 1998) has challenged. When Bob Bodenhamer and I began re-examining that model we did not know that we would end up totally questioning the prefix “sub” in “submodalities.” Yet we did. We discovered that there is no “sub” in the sense of a lower logical level. We have qualities, facets, components, elements, variables, and distinctions of representations in all of the sensory systems. Yet these representational distinctions are not a “sub” level. They rather exist as part and parcel of the representations. And inasmuch as you have to go meta to even detect these distinctions, we also discovered (not surprisingly) that you have to go meta to shift, alter, and transform this structural distinctions. What does that mean in terms of modeling? All of this highlights how NLP, as a Model of Models (Modeling II), continues to model and expand itself. And so it should. And the originators anticipated this. In 1999 and 2000, we began conducting Modeling Workshops in Neuro-Semantics and created a follow-up work to this work, a Training Manual in Modeling entitled, Advanced Neuro-Semantic Modeling. It’s the text that we use for our Neuro-Semantics Modeling Workshops.